The City of Brampton altered documents related to matters central to a $28.5 million lawsuit it is facing, then provided the modified city minutes to the plaintiff while the case was before the court, according to evidence heard during trial. A lawsuit filed in 2011 by Inzola Group, which alleges it was unfairly disqualified from bidding on a $500-million downtown development deal, claims former senior officials and then-mayor Susan Fennell were biased against the company and didn't want it to get the lucrative contract. Fennell and the City of Brampton have denied all allegations in the lawsuit. 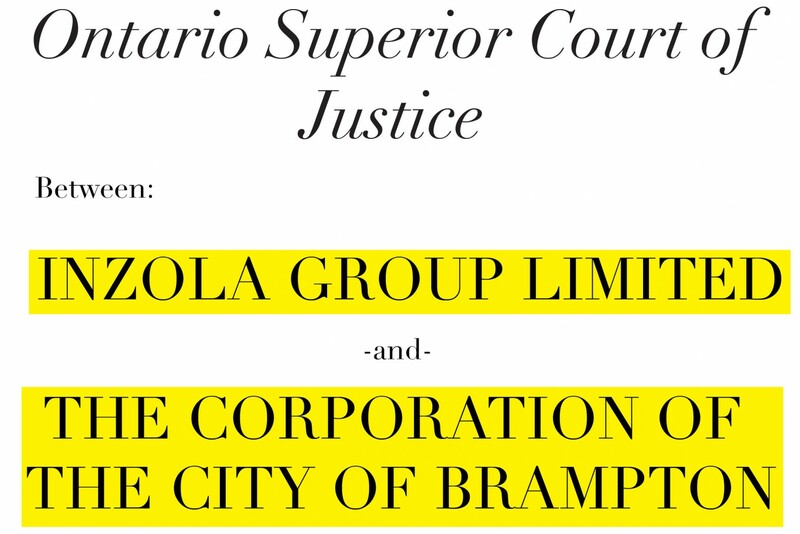 In June, during the trial for the case in Orangeville, Stuart Svonkin, representing Inzola, showed the court minutes of senior staff meetings held to discuss the project, including a dozen sets of minutes which appeared to have been altered sometime before and/or after the lawsuit was filed. Svonkin cross-examined former Brampton treasurer Mo Lewis, who chaired a group of six senior staffers who sat on the selection committee (known as the Evaluation Steering Committee) for the deal. Julian Patteson, who had been the head of buildings and properties for the city, served as vice chair of the committee, whose members, under the rules of the process, were the only people allowed to see the full bids. The selection committee was responsible for having the bids carefully analyzed and then recommending one bidder that city council could either accept or reject. Under the rules of the procurement process, if council rejected their recommendation, the entire bidding process would be scrapped. Inzola's bid, revealed during the trial, was tens of millions of dollars below the successful bid. Before the company was disqualified, the city had tried to prevent it from ever revealing any details of its bid in the event it wasn't selected. Inzola's refusal to agree with this condition, in the form of signing a non-disclosure agreement after the bid was submitted, led to the company's disqualification in 2010. According to the city, the official reason for the disqualification is that Inzola breached the bidding process's no-contact rules, which were designed to prevent lobbying, when it attempted to address council formally during a public meeting in order to resolve the dispute over the non-disclosure agreement the company had been asked to sign after submitting its proposal. 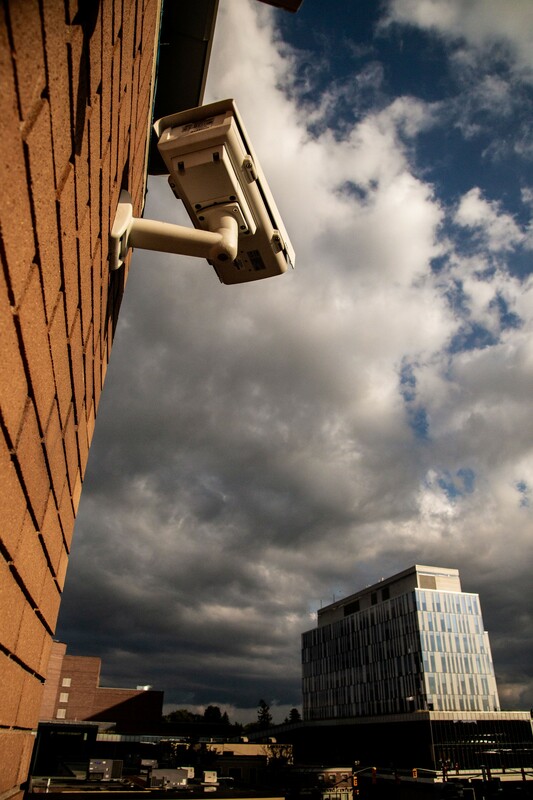 Inzola felt the agreement was excessively secretive and restrictive. During trial, the company denied that it had breached the procurement rules when it attempted to resolve the issue by trying to address council. Inzola filed its lawsuit against the city in July 2011. 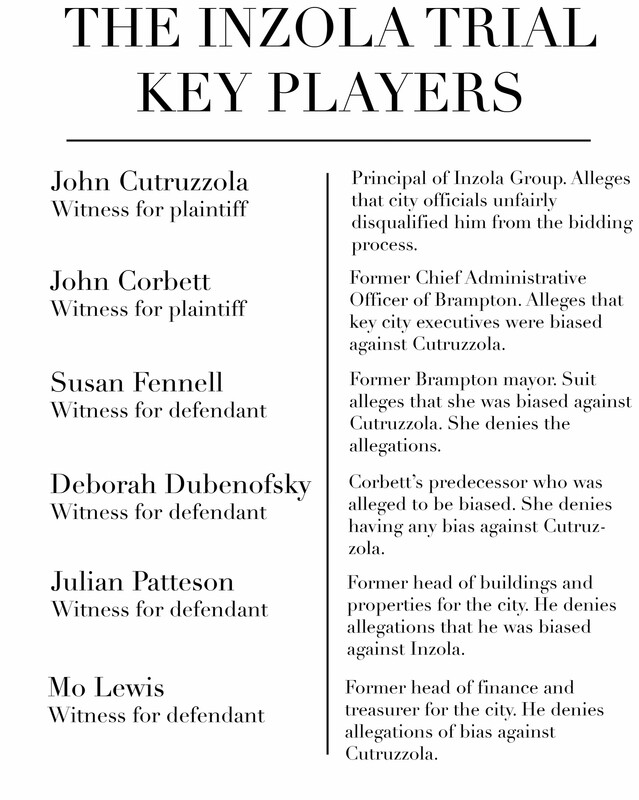 During the trial, Lewis denied allegations that he and two other senior staffers, Patteson and former city manager Deborah Dubenofsky (who was not on the selection committee), were biased against Inzola's principal, John Cutruzzola. Svonkin showed Lewis the original draft of minutes taken of a selection committee meeting that took place three days after council approved Dominus in March 2011. The draft included the quoted words: "council sent a message to the community that Inzola is not the big guy in this town anymore." This followed earlier testimony from John Corbett, another member of the selection committee and the key accuser in the case, who testified that he clearly remembered Lewis making the comment at the meeting in question. However, the court heard those words were removed from the official minutes a month after Inzola filed its lawsuit. The version of the minutes provided by the City to Inzola in the pre-trial discovery process did not include the comment. Inzola learned of the removed comment only after further document disclosures, following court orders to the City to release certain records, emails and other documents that Inzola had sought to help its case. Svonkin took Lewis back to the period shortly after he made the comment during the committee meeting. McCullough sent out to committee members her original draft of the minutes on May 24, 2011, for review, to make sure everything was correct. Svonkin put to Lewis that no correction had been requested at the time (prior to the filing of the lawsuit), and showed the court a copy of McCullough's May 24 email. There is no record in the litigation that Lewis, Patteson or any other staff member advised McCullough at that time that the minutes needed to be amended. "You didn't tell her in May or June to remove (the comment about Inzola not being the 'big guy' in this town anymore)," Svonkin said. "You told her to remove it in August. August 31st, you tell her to remove the comments." In an email written on Aug. 31, 2011, to McCullough, shown earlier in court, Lewis directed her to go back into the minutes and remove the comment. This was more than a month after the lawsuit was filed. "In between that period (from May 24 to Aug. 31) this lawsuit was commenced. You know that." "You were told to gather up all the documents (that might be asked to be produced for the litigation)." "You were told not to destroy or alter documents." "Stands to reason," Lewis replied. "Seven weeks after this litigation (was commenced) you asked for the minutes to be altered." "This wasn't the only time that staff instructed meeting minutes to be altered after this litigation, correct?" "I don't recall," Lewis answered. Svonkin then took Lewis through another 12 sets of minutes provided to Inzola for the litigation that, according to documentary evidence shown to the court by Inzola, appear to have been altered at some point. Some of the comments removed from minutes originally showed that selection committee meeting summaries had been shared with Dubenofsky, who was not supposed to have any decision-making role in the process. She testified that she played no decision-making role, and was only kept abreast of timing issues so that she could report to council on key milestones that were being reached in the process. Corbett, who was on the selection committee (and in 2012 replaced Dubenofsky as the city's top bureaucrat) testified that Dubenofsky's role went far beyond that. He testified that she controlled the decision-making process to make sure Fennell's preferred bidder, Dominus, got the contract, not Inzola. Dubenofsky and Fennell denied the allegation. Adam Stephens, a lawyer representing the City of Brampton, suggested to Corbett that he has a "personal animus" toward Dubenofsky because she tried to fire him before he eventually replaced her. Corbett denied the allegation. Lewis was taken through the altered selection committee minutes, with references to briefings with Dubenofsky removed. Lewis was taken through approximately a dozen sets of minutes that appear to have been altered. The original minutes for one of the selection committee meetings refer to a comment by one of the senior staffers that, after Inzola had been disqualified, if the selection process failed it would "benefit Inzola" because the company could re-submit its bid in a brand new process. Those words were later removed from the minutes. Lewis acknowledged, after being shown all the original minutes and the altered versions of them, that they had been changed. But he could not explain why or who had ordered them to be altered. Then Svonkin took Lewis to minutes for a May 2010 selection committee meeting, when issues surrounding Inzola's subsequent disqualification were dealt with. In August 2011, 15 months after that meeting and a month after the lawsuit was filed, a new version of those minutes was circulated, with comments added that did not appear in the original version. (It's unclear exactly when the minutes were altered). Those added words appear to mitigate the lawsuit's allegation that Inzola was unfairly disqualified. The added sentences, which Svonkin read to Lewis, state that Inzola's concerns about the City's demands for a non-disclosure agreement were being considered and that the City was providing "every reasonable opportunity" to allow Inzola to remain in the bid competition. No such words appeared in the original version of the May 2010 minutes, taken shortly before the disqualification. "I'm going to suggest those words were added to support the city's position in the litigation," Svonkin said. "I can't speak to that," Lewis replied. Stephens argued that emails show some of the changes to minutes were requested long before the lawsuit was filed. Inzola's lawyers presented evidence during trial that suggests the city anticipated the company might take legal action, around the time of its disqualification in the summer of 2010. "You recall that (Svonkin) put to you that those minutes were altered as a result of this litigation," Stephens asked Lewis. Svonkin objected, stating that he gave no "exact date" as to when the minutes were actually altered, other than those Lewis directed to be changed in August. He said Lewis was asked about the timing and was shown that at least one set of the altered minutes was circulated for review in August 2011. "The clear inference was that, as a result of the litigation, the minutes were changed," Stephens argued. 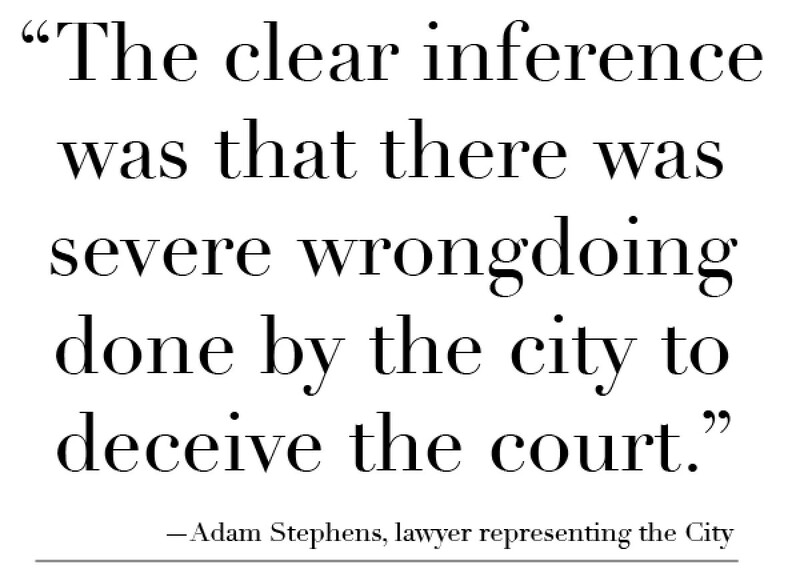 "The clear inference was that there was severe wrongdoing done by the city to deceive the court."